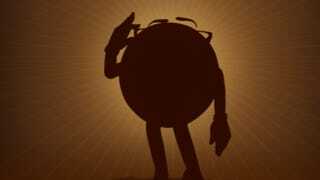 If you've spent hours fretting that there aren't enough feminist candy spokespeople, here's some good news for you: M&M's will unveil a new lady character in an exciting Super Bowl commercial. Her name is Ms. Brown, and she represents, you guessed it, the brown M&M! She will join the five other talking M&M mascots—red, orange, yellow, green, and blue—in promoting the addictive chocolate pellets and also making you feel slightly weird about eating a candy that can talk. Ms. Brown is the second lady M&M. (Ms. Green was the trail blazer.) She has an impressive-sounding personality, and her silhouette reveals she wears glasses—so you know she's smart. The New York Times describes her as, "an intelligent woman with a sharp wit who finally decided to reveal herself after working for decades behind the scenes as 'chief chocolate officer.'" Ooh, a career woman. And how fitting since she sounds exactly like the brown M&M—a total workhorse among the M&M's but never a color anyone notices...until now. Looks like we finally have ourselves a female icon we can be proud of and snack on! ?